Church Fathers listening to the words about a vineyard, taught that the vineyard God called us to work in – is our personal life, the world we live in, things we are responsible for. Being on earth we need to remember that all God’s creatures are not in our privacy. We are only governors of this land and environment, and even of a private life. Head and Father of UGCC His Beatitude Sviatoslav highlighted it in his homily on 18th of September during Hierarchal Divine Liturgy at the Patriarchal Cathedral of the Resurrection of Christ. “God gave us life as a task, so we advance in righteousness. God fosters us in our growth. Furthermore, He comes to us when we want to possess everything and put Him out of the way”, the preacher said. According to his words, a person often thinks that she can cope without God anyway. Think that they are able to possess everything they have. That is how they “kill, crucify Christ, who visits them every day”. His Beatitude Sviatoslav suggested to analyze reality through the perspectives of Pope Benedict XVI who taught that “it is impossible to live in the world without God”. “World where people drive out the servants of God, where they constantly crucify and deny the Son of God – is doomed to war and murders. The greatest threat for us is to lose everything we have, because we want to be sovereign masters and holders”, Head of Church teaches. “However God comes to us as the Son of God, knocking at our hearts… Let us look into our hearts and ask ourselves – what the good deeds, fruits from our own vineyard we can present Him today”, the major archbishop invited to think over, calling us to be good performers of our own life and cherish what God has given us. All the gifts we have ought to be increased and returned to God – that is the sense of Christian perception of goods He gave us. “I want to greet special people in God’s vineyard. Today we eleven catechists of Kyiv Eparchy are receiving their bachelor’s diploma. Welcome to the God’s vineyard. We send you to work in a special way – to cherish human’s souls. 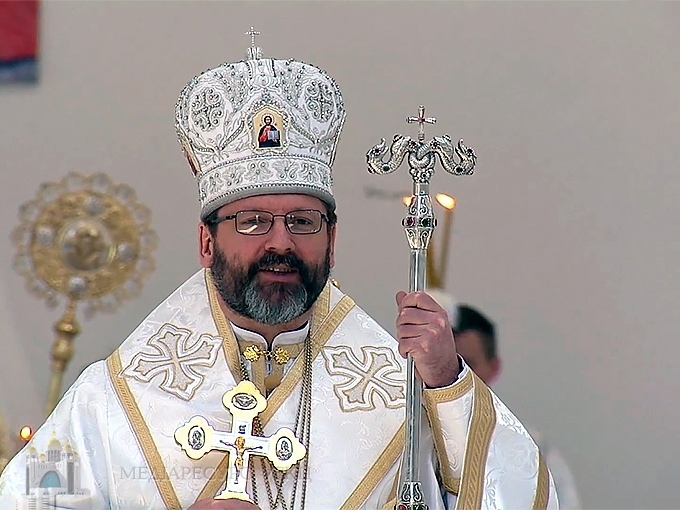 Teach people that Christ is coming and people must gather good fruits from their lives, what is needed to give back to God”, His Beatitude Sviatoslav said at the end.